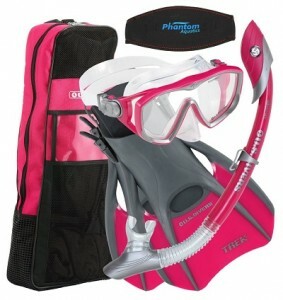 The US Divers Diva Travel Bag is a full ladies snorkelling set in a cool, coordinated raspberry pink colour scheme, which includes a high quality dive mask, snorkel and fins, packaged in a convenient waterproof travel bag. Whether you are going on holiday and want something you can easily throw on to carry your snorkelling gear for casual swims off the beach or you are planning a diving trip and want to conveniently carry these essential parts of your kit around with you, this set aims to give you what you need as well as looking stylish. So, how good is this US Divers product? We put the gear to the test for some snorkelling to find out. The exact US Divers products that come in this package are an Admiral LX ladies mask, and Island Dry flexible snorkel, Trek fins, and the Diva travel bag which is designed to carry it all together. The mask offers Pro Glide pinch and pull buckles for adjustment and a low profile single lens, with a hypoallergenic silicone face skirt. The snorkel has a mouthpiece made from the same gentle, hypoallergenic silicone, and is fully submersible, featuring a flexible section with release valve and what the manufacturers call ‘Pivot Dry’ technology. This effectively means it is suitable for easy use when diving or free diving because it is very to clear after submersion compared with basic rigid designs and those without purge valves. The fins are adjustable for size and designed to offer a boost without making it hard to move around or adding too much resistance to the knees and ankles, making them the right kind of style for beginner or casual snorkelers or divers. How Well Does the Gear Work? One often overlooked but very important feature of this kind of gear is how easy it is to get the fit of the mask right. Masks that are hard to adjust make for very annoying experiences in the water, so we made sure we tested this one on a few people for ease of getting a good fit. You will be pleased to know that the mask is very easy to tighten and loosen, and fits to the face nicely when in use. The fin size is also great, particularly for casual users who may find larger fins hard or weird to use. They also pack really nicely into the layout of the travel bag, which is good news because often the fins are the most unwieldy piece of kit you have to carry. In fact, the bag is surprisingly innovative in how easy it makes carrying the rest of the kit, and leaves a good amount of room for carrying the other stuff you are taking with you. We found this to be a really good set of snorkelling gear, that is easy to adjust, put on and use as well as being well designed from a travel standpoint. As this is not a hugely expensive set, it is perfect for people who are just getting into snorkelling or diving or who only do it when they are on holiday and don’t want to invest a large amount of money but still want attractive, practical gear of their own to use. This entry was posted in Fins, Masks, Reviews, Scuba Diving, US Divers and tagged Diva Travel Bag, Fins, Mask, Snorkel, US Divers. Bookmark the permalink.